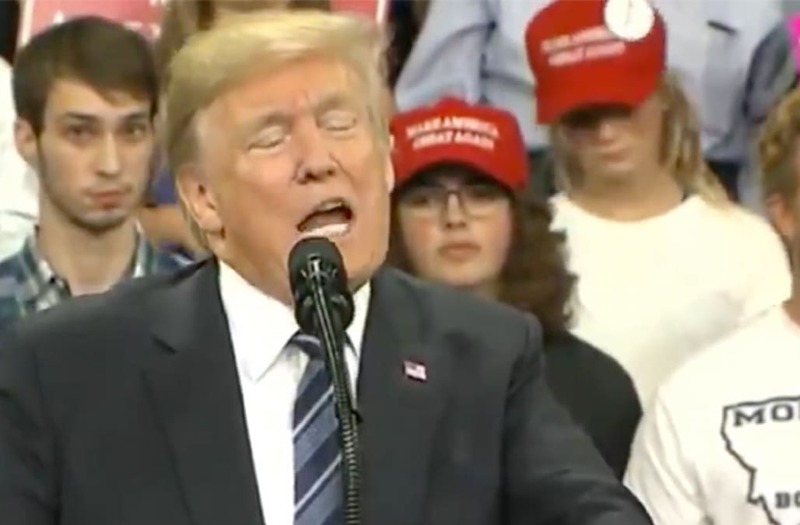 An audience member had some colorful reactions to President Donald Trump's speech at a campaign rally in Billings, Montana on Thursday. The unidentified man made several facial expressions as the president delivered his remarks. A woman later approached the man mid-speech and briefly spoke to him before taking his spot in the crowd. Standing behind Trump on Thursday night, the unidentified man made several animated facial expressions as the president spoke on his usual list of topics. A woman wearing the a "Make America Great Again" who stood beside the man appeared to be in on the joke. Trump's campaign rallies are often characterized by raucous interactions between supporters, Trump himself, and sometimes protesters. After conducting 520 campaign rallies, Trump's staffers appear to have developed a surgical approach to addressing the riff-raff. During a rally in Evansville, Indiana, last week, one of Trump's volunteer staffers blocked a news photographer's camera lens as he tried to take a photo of a protester.